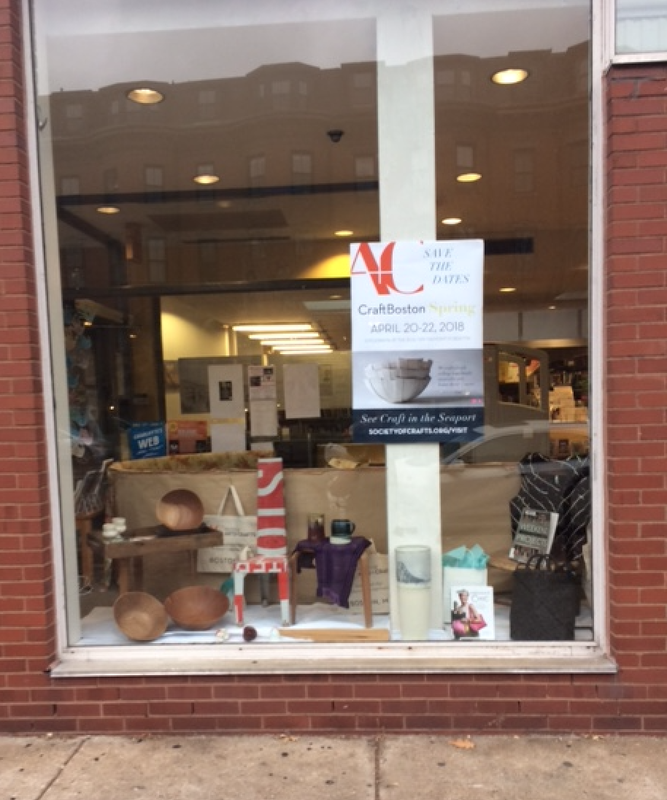 The Society of Arts and Crafts, which is sponsored the twelfth holiday exhibit of juried crafts by artists from all over the country at the Hynes Convention Center from December 14 to 17, has installed a Local/Focus display in the South End library's Tremont Street window featuring some of the crafts for sale at the Hynes. If you missed it, your loss, but it's not the end of the world. Next April 20-22, the Society will have another crafts fair at the Cyclorama, right here in the South End. The Society of Arts and Crafts dates from the end of the 19th century and is America's oldest arts and craft nonprofit organization. It was located for forty years on Newbury Street but moved last year to the Seaport District. 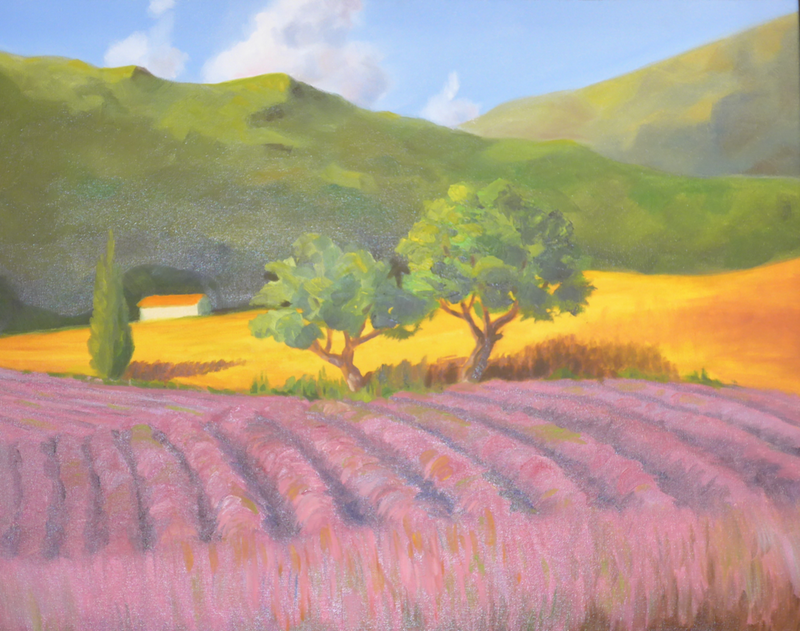 The mission of the Society has been to "develop and encourage higher artistic standards in the handcrafts." Local/Focus is a project sponsored by the Friends of the South End Library to connect local non-profits, creative entrepreneurs and artists to the branch library with installations in its Tremont Street window. The entrance fee to the Hynes of $15 was reduced to $12 for whoever mentioned the Local/Focus window. All the revenue from ticket sales supports the Society of Arts and Crafts, which is the nations oldest craft non-profit organization. 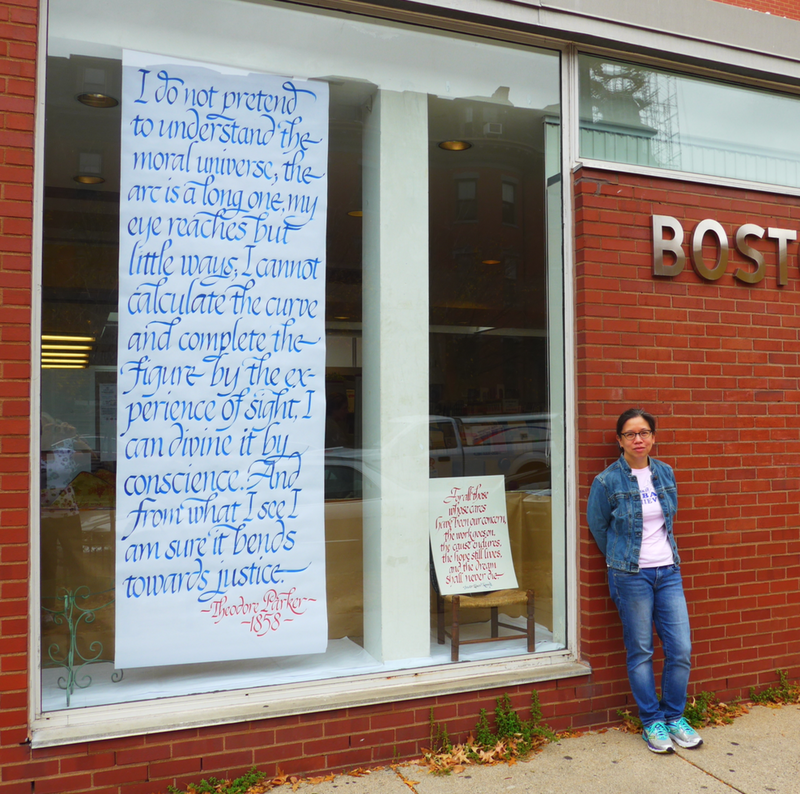 Emily Gallardo, a South end calligrapher with a studio on Waltham Street has installed a ten-foot scroll and a smaller sample in the Tremont Street window of the South End library honoring both the art of calligraphy and the social justice sentiments of two important Massachusetts luminaries, Transcendentalist and abolitionist Theodore Parker (1810-1860) and former Senator Edward Kennedy (1932-2009). "I do not pretend to understand the moral universe, the arc is a long one, my eye reaches but a little ways; I cannot calculate the curve and complete the figure by the experience of sight, I can divine it by conscience. And from what I can see I am sure it bends towards justice," says one; "For all those whose cares have been our concern, the work goes on, the cause endures, the hope still lives and the dream shall never die," says the other. Gallardo learned calligraphy in high school, majored in graphic design in college, and worked in advertising and marketing before she struck out on her own. She has worked with clients like Neiman Marcus, Ralph Lauren, Hermes and Burberry and teaches calligraphy. In addition, she has and affinity for cross-stitch, and developed kits with samples that range from animals to historical figures. The installation will be up until the end of this month. Gallardo can be reached at www.emilygallardo.com.